Judaism is a monotheistic faith, meaning that Jews believe there is only One God. Often this God is beyond our ability to comprehend, but God is nevertheless present in our everyday lives. How individual Jews choose to understand this manifestation of the divine varies. Some connect with God through prayer, others see the divine in the majesty of the natural world, others may not think about God on a daily basis. Each individual's relationship with God is unique and personal. 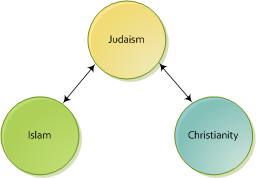 Muslims monotheism is closer to that of Judaism than Christianity, rejecting the Christian concept of a "Trinity." Muslims believe that God, creator of all of existence, is just, omnipotent, and merciful. Muslims also reject the anthropomorphization of God in other monotheistic religions like Christianity or Judaism. For Muslims, God is completely "other" — God does not talk, does not walk and does not do anything like humans. Christianity isn't as easy to define - in fact there are many religious groups who consider themselves Christian but have very different beliefs. Some of those are Catholic, Protestant, Christian Scientist, and Rosicrucians. Very generally speaking, Christians believe in a single God and is a Monotheistic religion. They generally believe in the trinity which is the God, Jesus, and the Holy Spirit are homoousios (the same substance). All three believe that their God is the God of Abraham. Jewish people believe that Christians believe in the same God that they do and Christians also believe that they believe in the same God as Judaism. Similarly, Jewish people believe that Muslims believe in the same God that they do and Muslims also believe that they believe in the same God as Judaism. However, Christians do not believe that they believe in the same God as Muslims and many Muslims do not believe that Christians believe in the same God as they do. To me, I believe that if you believe in one all mighty God then you believe in the same God as I do - but your worship is different. Do Muslims and Christians believe in the same God? Yes. It's the same God. Essentially, the word "Allah" in Arabic is not a translation for "God." It has more connotations than that; for example, it means a being that is inherently unique, and cannot be feminized (goddess) or pluralized (gods). Also, Islam elevates the status of Christianity and Judaism ("ahlul kitab") because they are sourced from the same source -- the same One God (Allah) -- albeit that Islam claims to be corruption-free, while stating that the latter two were corrupted by the hands of humankind. Of course this is broad and doesn't address nuances, but there it is. Say, "He is Allah , [who is] One, Allah , the Eternal Refuge. He neither begets nor is born, Nor is there to Him any equivalent." Quran recognizes Jesus Christ, Moses and Ibrahim. They have been mentioned in the Quran as valid messenger of God. There is not question about it. Islam abides by Bible to some extent. It can be used as source of guidance if something is not clear enough in Quran. Muslims has utmost respect for Jesus Christ, Moses. When they call their names, they give them special reverence title, that they do not use for any one else but only for the messengers of God. The following verse in Quran 5:46 talks about Jesus Christ. There are already nice answers discussing the topic of the question. As linked, I visited the other stackexchange sites on the same question. And I felt to share a summery which is actually an answer to the question. It seems Judaism thinks, it's the same God they and Muslims are worshiping link. But Christianity has gone away from the real concept of God with trinity link. Christianity thinks, they are worshiping the same God as Judaism and Islam. But by rejecting trinity, the do not fully recognize the real God. And as you can see, Islam holds the view all three religions are from same God, Allah. The Jewish idea of God remains alright with possible distortions in other rulings. But in the case of Christianity, the idea of God became distorted with trinity committing the grave sin of Shirk. Say: He is Allah, the One and Only;  Allah, the Eternal, Absolute;  He begetteth not, nor is He begotten;  And there is none comparable unto Him. Hence any religion which violates the above definition of God does not worship Allah but their own model of Allah. Only Jewish religion is compatible with the above definition of God. But there are a few minority Christian sects like Universal Church, Mormonism etc which don’t believe in the divinity of Jesus and hence worship Allah who revealed the Injeel. Jews worship the lord of Bani Israel which in none but Allah hence they worship the same God as Muslims. Moreover Jews themselves consider Christians to be idolaters (Avodah Zarah) while they consider Muslims to be monotheists (Rambam in Sefer Qedusha, Hilkhot Maakhalot Asurot 11:7 ) having share in the hereafter. The truth is that it just calls the Ahle Kitab to the absolute truth which is in their scriptures without regard to their actual beliefs, In fact in the above verse Allah just calls the Ahle Kitab to worship one God alone which they have ceased doing. Here again Allah only conveys that our God is one without clarifying whether we worship the same God, in fact the presence of such verse indicates that they were not worshipping the same God hence they have to be informed that our God is one God unlike the Christians who believe in the trinity and Godhead of Jesus. As Muslims we believe in the tawheed (oneness) of God. We believe in the tawheed of his rububiyyah (lordship), which means that there is no power or movement except with Allah, we believe in the tawheed of his uluhiyyah (godship), which means that nothing is worthy of worship (ibaadah) besides him and to worship anyone besides him is shirk (shittuf or avodah zarah) and is the one sin that will never be forgiven if one is to die upon it, and we believe in the tawheed of his names and attributes, which means that we affirm and negate for him what he affirms and negates for himself in the quran and what the messenger of God muhammad has said and we do not liken him to his creation but we do not negate his attributes through interpreation. Just like God has an essence so do we but his essence is unlike ours. God is also above his throne above the seven heavens seperate from the creation and in a way that befits his majesty. We believe to call upon anyone other than God, whether it be a prophet, an angel or a dead person is tantemount to shirk (polytheism). We believe that God has no son and was not himself begotten and to believe so is also polytheism. All the prophets were sent to their people to their people to call them to worship God alone. Muhammad is the final prophet and was sent to all of mankind. Whether we are to believe the tora, the psalms or the new testament are corrupted is irrelavent as they have all been abrogated. God has promissed to preserve his final revelation which means he will preserve it from increase or decrease. It do not believe any jew or christian will deny that the old and new testaments have not been changed even if it is only one word. We also believe that the jews went astray by not practicing what was revealed to them and by hiding the truth and we believe that the christians went astray by acting upon ignorance. Islam means submission and it is compulsory for all of mankind including bani israel to submitt to their creater and to worship him alone in accordance with the legislation given to Prophet Muhammad. We are the only religion that has a chain of narration going back to the Prophet and so we can verify what is said to be his words. It is not possible to practice a religion or have a creed that one believes in and is not a 100% sure that it can be authentically linked to the Prophet. We only believe in what is established and we dont just rely on good opinions of people. Peace be upon those who follow the guidance. Yes it is the same God who loves us all, we have God dwelling inside us and that was Jesus' message. Sometimes we listen to God sometimes we dont. We learn over time to listen to God and receive his Grace, to recognise God in others. Jesus is the son of god, we are all children of God! dont let details of religion divide us. God loves you and me! Gods love transcends rules. Jesus said his new commandment is to love god and love your neighbour as yourself! its good news! "Noah said, "My Lord, indeed they have disobeyed me and followed him whose wealth and children will not increase him except in loss. And they conspired an immense conspiracy. And said, 'Never leave your gods and never leave Wadd or Suwa' or Yaghuth and Ya'uq and Nasr." The gods Yaghuth & Yauq were 2 of the many gods worshipped by Noah's tribe. Both of these gods contain 4 letters just as YHWH is constructed of 4 letters (tetragrammaton). These names are composed of the name of the god (a theophoric prefix), Ya which is followed by an attribute. Yaghuth means the god, Ya, helps and Ya'uq means the god, Ya, prevents (harm). Similarly the name Yhwh means the god Ya lives and Ya the snake. The best translation of Yhwh would be 'the living snake god'. According to Dr. Richard Steiner, 'hw' is the ancient West Semitic word for snake. (The final 'h' in the name Yhwh is a Hebrew noun suffix). The snake, (nehushtan in the Bible), was Yhwh's sacred animal. Ancient gods were often worshipped in the forms of their sacred animals. For instance, the Canaanite god, El, was worshipped in the form of his sacred animal, the bull. Noah's tribe lived in Al Judi (Q 11:44) or the rainy place, an ancient designation for Yemen, which experienced a twice yearly heavy monsoon. Yemen early on became very wealthy due to the incense, gold, copper and exotic goods trade. Yemenese tribes as the Minaeans (Ma'in in Arabic & Dedan in the Old Testament), who originated in Hadhramaut, caravanned their goods north and brought their gods with them. Yah (Yhwh) was one of these gods. (Yah is a shortened form of Yhwh. The name Yah can be found in this shortened form throughout the Old Testament). According to Dr. J.A. Montgomery, in his book, Arabia & the Bible, page 134, Yah was another name for the Minaean moon god, Wadd. Like Yhwh, Wadd's sacred animal was the snake. "And as Moses lifted up the serpent in the wilderness, even so must the Son of man be lifted up:"
So, YHWH began as an ophic (snake) cult. The origin of the name bears no relationship to the origin of the name Allah (swt), which means "The (only) God. There is a lot more information on this subject at http://arabianprophets.com. Read the article entitled Serpent Yahweh, YHWH Snake God of Israel. And Allah (swt) knows best!!! Here is how they all connect. Attributing actions to "the All" when it is actions attributed to objects creates much confusion. So the Jews have a confusing God, until they strip down to what is plainly in front of them. Existence. They have the same God. "The All". "All-ah" means "The God". Cool how the words all work together right? All of these together are still "the All". It is simply categorized to help understand that people LOVE to talk about what they are thinking about. Happy living forever. Peace. I love you. Do Muslims worship the same deity as Christians? Who are the Christians and who are the Jews? Can Christians use the word Allah according to Quran? What do Muslims teach about the schism of faiths after Jesus Christ? From the Islamic perspective, how can a Christian pray to Allah? Are Muslims technically at war with Christians and Jews?